Nader Mostaghimi was born and raised in Toronto, Ontario and graduated from the University of Waterloo in 2012 with a B.Sc. in Earth Sciences, Geology specialization. He was fortunate to have been a part of the co-op program where he had the opportunity to gain field experience in between study terms in various fields before finding work in mineral exploration. He began working for the Geological Survey of Canada and Natural Resources Canada mapping sequence stratigraphy and quaternary geology offshore of the Avalon Peninsula, from Seal Cove to Motion Bay. He then worked for Stantec Consulting Ltd. carrying out groundwater monitoring, and surface water sampling procedures for contaminated sites in southwestern Ontario. He spent a winter in Fort McMurray, Alberta learning about crude oil and assisting with daily mine operations at Syncrude Canada Ltd. His last work term was situated in central Quebec, prospecting for Ni-Cu massive sulphides for Vale Canada. It was at this time where he found his passion for the natural sciences, travel and exploration meet. 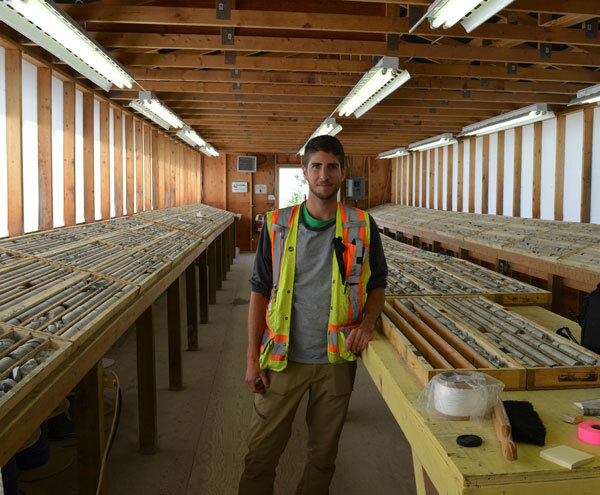 He had the opportunity to work at Taseko's Gibraltar mine for their summer 2013 exploration drilling program where he spent his time off gathering data for his Master's thesis. Nader is currently a Masters student at the University of British Columbia under the supervision of Lori Kennedy, and expects to complete his thesis by December 2014. His research focuses on structural geology at the regional, local and micro-scale, as well as geochronology and economic geology. Aside from his research, he enjoys working as a teaching assistant for introductory courses, structural geology I & II, and as a TA for the Saltspring Field School in 2013. He presented a poster at the 2014 Roundup and KEG conferences, and has an accepted abstract for a poster at the 2014 SEG conference in Keystone, Colorado. Nader played varsity ultimate frisbee for his undergraduate and graduate universities, and leads a healthy and active lifestyle in and outside of the city, while surrounding himself with arts and culture as often as he can. Project: Geological setting, structural geology and timing of deformation at the Gibraltar Cu-Mo Mine: controls on mineralization. The Gibraltar Cu-Mo porphyry deposit is located 65 km northwest of Williams Lake and 45 km southeast of Quesnel and is hosted in the Late Triassic Granite Mountain batholith. The Gibraltar Cu-Mo mine is one of several mineralized systems currently being investigated as part of the Geological Survey of Canada’s Intrusion Related Ore Systems TGI4 Program. The main ore zone on the mine property, hosted within the Mine Series Phase tonalite, is structurally dismembered by several deformation events. Questions still exist regarding the relationship between mineralization and the earliest deformation. My research is aimed towards unravelling the geometry, kinematics and timing of the deformation events that have affected ore distribution and to determine if mineralization was synkinematic with the earliest deformation event. Maps have been constructed at 1:2000 scales, of bench walls located within four of the 4 open pits, including the Granite operational pit. Documented structural geology at the mine scale, along with micro-structural analysis of oriented and non-oriented thin sections will allow for a better understanding of the fault kinematics and geometry, and allow the placement of constraints on temperature. Geochronology is of paramount importance to determine the absolute ages of deformation. A suite of illite samples from which we will obtain Ar-Ar cooling ages on different fault zones, high strain zones, S1 foliation and illite which crystallized with late-phase Mo-mineralization. Along with an Ar-Ar (hornblende) cooling age and U-Pb (zircon) geochronology (TIMS) for a more accurate crystallization age on the Mine phase tonalite, geochronology will be interpreted with field observations and microstructural analyses of the textural relationship between deformation, veining, and mineralization. Short wave infrared spectroscopy coupled with x-ray diffraction analyses of outcrop and drill core samples will allow evaluation of fault zones, veins and alteration zonation for any similarities or differences between clay and chlorite minerals. Ultimately, a 3-D structural geological model of a select area that will exemplify the structural geometry of a portion of the mine will be constructed. This model, in conjunction with the age constraints and microstructural analyses findings will be placed into a regional tectonic framework.